With Verlander and Upton out, the top of that ledger is significantly lighter, and that trend is likely to continue into the offseason, when the team will trade Ian Kinsler and decline to exercise their option on Anibal Sanchez. They’ll still owe Verlander $8 million next year under the terms of the trade with Houston, and there will be raises due to a number of their arbitration-eligible players (Nicholas Castellanos likely being first among that cohort, followed by Jose Iglesias, Shane Greene, and perhaps Alex Wilson), but Detroit’s front office should be feeling much lighter on its feet. As I’ve mentioned again recently, there also should be a revenue bump from a new TV deal next year. Of this group, one is in the hall of fame (Ivan Rodriguez), and at least two are working in baseball broadcasting (Craig Monroe, FSD; Sean Casey, MLB Network). Only Verlander, Curtis Granderson (Dodgers), Fernando Rodney (Diamondbacks), Andrew Miller (Indians), and Jason Grilli (Blue Jays) still play in the majors, and Verlander was, by far, the last of the 2006 crew to leave Detroit. You can read plenty about the prospect returns the Tigers received from yesterday’s trades elsewhere on the web. Here‘s an initial snapshot to get you started. The Tigers got 23-year-old Grayson Long, a starter currently having a strong year in AA. He only threw 65 innings across three levels last year due to injury, but he does have the appearance of an innings eater if you buy into the archetype scouting. Based on the public scouting views and one source I spoke with this afternoon, Long’s fastball is solid in the low 90s but his secondary stuff is a bit questionable with opinions ranging from fringe to flashes of above average. He has a change and slider but it’s not clear they will play at the major league level to the point at which he could be a successful starter. That might lead him to a bullpen role, but he has pitched well so far in the minors and I’m a big believer in letting a player keep going until the performance tells you to stop. There’s definitely potential for something really exciting but even the floor seems perfectly fine given the cost. Grayson Long reportedly a 3-pitch guy (FB, SL, Change). FB sits low-90's w/ ability to tap 95 MPH. SL/CH average to slightly above. It appears the Tigers came to the same conclusion, because the only way this trade makes sense is if Detroit was treating Upton as if he was on an expiring contract just like J.D. Martinez and Alex Avila and needed to get something for him now before he leaves in the offseason. After watching Upton play here in Atlanta with his older brother as members of the Braves, I have been tracking his time– a bad dip with a fierce, late recovery in 2016, followed by a very solid 2017– in Detroit on this site with some care, and I will watch how the market responds to what I now agree will be his likely free agency this offseason. While he may not get a raise, he’s likely to wind up with a team with greater playoff odds than those of the Tigers or Angels, who, against many of those same odds, remain in the American League wild card hunt. Most of all, I’m happy to see Upton have such a strong rebound. Detroit’s fans didn’t deserve him anyway. “The Upton Myth” has nothing to do with the delayed Upton-Verlander nuptials and everything to do with Verlander’s teammate of no known relation to his fiancee, Justin. To hear fans tell it, the Detroit Tigers left fielder’s two-year tenure in Detroit has not been a happy one. Many of them want Upton to opt out of his $22.125 million annual contract after the current season but believe he’s been too bad since becoming a Tiger to make that a realistic possibility. The critical Upton narrative is confounding for the reasons many external narratives about people confound: it originates in an established truth that’s treated as a surprise and subsequently serves to obscure the truth moving forward. For Upton, the established truth was that he struck out at a high rate. When he arrived in the Motor City, some seemed surprised that he continued to strike out at a high rate, pegged him as an overpaid failure, and haven’t looked back. First impressions are powerful and sticky, so when Upton had a very poor start to his first season in Detroit last year, many gave up on him, ignoring signs that the outfielder– who was adjusting to the American League after nine years on the senior circuit– had returned to form by August but was hamstrung by bad luck. Then there was that validating September explosion– Upton hit thirteen home runs, slashed .292/.382/.750, and posted a 196 wRC+, basically Babe Ruth’s career line, nearly propelling the fading Tigers to the postseason all by himself– that somehow was forgotten amidst the sudden excitement of a playoff push and a disappointing finish in Atlanta. The thought that, with Upton, the Tigers didn’t get what they wanted in 2016 seems a bit off. There was an extended bad stretch, to be sure, but Upton’s always been a streaky, high strikeout, high home run guy, and that’s who he was in 2016, tying a career-best mark by finishing with thirty-one homers. The current season, already an unequivocal, strong bounceback from last year’s harsh dip, has seen Upton achieve a quiet consistency that has him on track for what could be the second or third-best season of his eleven-year career. Tigers fans still blow their tops whenever Upton strikes out, though (and even considering that reducing his strikeout percentage– something he probably could do if he chose– likely wouldn’t alter Upton’s overall production profile). Why does the anti-Upton rhetoric remain? When it comes to the 2017 Detroit Tigers, we are in full-on damage-control mode here at ALDLAND, looking high and low for fixes for everything from the bullpen to the infield defense. On an individual basis, though, no player seems to be the recipient of more scorn from those who express Tigers-related opinions on the internet than Justin Upton. The critical refrain, when it comes to the younger Upton brother, is simple: he strikes out too much. I spent many of the pages of last season’s Tigers diary on Upton. Having watched him during his days as a member of the Atlanta Braves, I knew he was a good and exciting player, but also a streaky player, and I hoped that Detroit fans would be patient enough to see through the streakiness and hold out for the production, they generally weren’t. Some career-low offensive numbers in the middle of the season didn’t help his case, and people (this website’s readers excepted, obviously) mostly missed that, in the final analysis, his full-season production was almost exactly as anticipated: an above-average offensive profile with thirty-one home runs, matching a career high. Also likely to be forgotten is his hot September– thirteen home runs, .292/.382/.750, and 196 wRC+, basically Babe Ruth’s career line– that was the main reason the team was in contention entering the final series of the regular season. The Tigers didn’t make the playoffs last year, though, and things are looking pretty bad right now, too, which makes it easy to continue to beat the Upton-strikeout drum. And look, he’s currently running a career-high 31.2% strikeout rate (ten percent above league average), which isn’t helping matters. To this point, the change hasn’t served to make Stanton better, just different. His 135 wRC+ this year is pretty close to his career 141 mark, as the reduction in strikeouts have also come with a small drop in BABIP and a continuing decline in his walk rate. And the latter is of particular interest, because it shows how differently he’s being pitched these days. In his 2013/2014 heyday, only 41% of the pitches thrown to Stanton were in the strike zone, about as low a mark as pitchers will go for a hitter who doesn’t instinctively swing at anything out of their hand. This year, pitchers are throwing Stanton strikes 44% of the time, about the same rate they’re challenging Trevor Plouffe and Albert Pujols. Pitchers are coming after Stanton now, perhaps recognizing that maybe he’s not taking the herculean swings that he used to take, and the penalty for throwing him something in the zone isn’t quite what it used to be. As his contact rate has climbed, Stanton’s doing less damage on contact than he used to be [sic], and perhaps not surprisingly, is now seeing more strikes thrown his way. These are all shifts more than total revolutions, as he’s still a power hitter who does a lot of damage when he hits the ball, but he’s now moved more towards the normal levels of contact and production, rather than being an outlier on both ends. The broader point, I think, is one that came to me during my look at switch hitters’ approaches to defensive shifts last year: we should engage in player analysis with the initial assumptions that (1) the player is a skilled athlete capable of undertaking multiple approaches to his or her sport, and (2) the player intelligently approaches his sport by selecting the optimal approach, given his or her strengths and weaknesses, designed for performance at the highest possible level. This is a conservative outlook that essentially assumes that the player’s status quo modus operandi represents the player’s optimal modus operandi. Like the Tigers fans who assume they can fix Upton by telling him to strike out less, it’s easy to assume we know better. As more complex investigations often reveal, however, the player had it right all along. Is the next Mike Trout already in Detroit? A strategic switch to beat the shift? With just under a month remaining in the 2016 MLB season, this is a good time to take stock of the Detroit Tigers and some of their key players. Today, the team sits 5.5 games back of Cleveland in the AL Central, and one game out of the second AL wild card spot, behind Boston and Baltimore. At this point, the division likely is out of reach, but the wild card is in play. Over the last two weeks, the Tigers have moved in and out of the second wild card position, and, although it’s served them well to this point, the Orioles’ volatile combination of bad starting pitching and overreliance on home runs is subject to collapse at any moment. Everyone knows Justin Upton has had a tough go of things during his first season in Detroit, and it’s reasonable to expect that there would be an adjustment period associated with his move to the American League– new pitchers, new parks– after spending his first nine seasons in the National League. 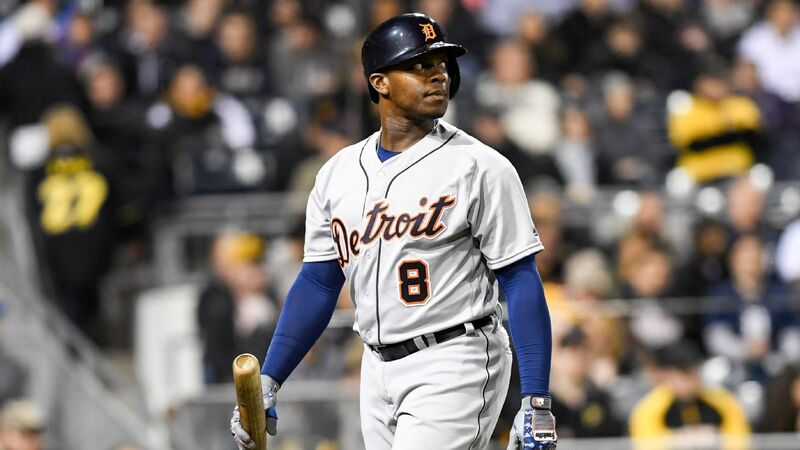 Especially exciting for Detroit was that two of [the Tigers’ home runs in a win against the Mariners] came off the bat of Justin Upton, who finally appears to be heating up for his new team after suffering one of the worst offensive stretches of his career. That earlier snapshot of Upton’s offensive production was through June 20, the date highlighted on this graph. Since then, Upton’s offense is declining again, and this graph (for reasons unknown to me) doesn’t even include the team’s two most-recent games, in which he went 0-7, striking out four times and grounding into two double plays. He’s a good player. He wasn’t sitting on the corner when they gave him the contract. He’s earned it. There’s a reason for that. Remember it. Nothing’s changed. He’s just a little bit unlucky right now. He’s not OK with it and I’m glad he’s not OK with it. He’s working hard and he’ll be fine. He’s unlucky. He’s not playing like [crap]. If not winning, the Detroit Tigers certainly have been doing a lot of home-run hitting over the last week or so, and, after some extra-inning disappointments during that stretch, they finally put it all together last night for an overtime win last night in a home series opener against the Seattle Mariners. That game featured three Tigers homers, each of which gave the team the lead. Especially exciting for Detroit was that two of them came off the bat of Justin Upton, who finally appears to be heating up for his new team after suffering one of the worst offensive stretches of his career. Upton’s first of the night was a dead-center bomb in the seventh that gave the Tigers a 7-6 lead, and his second, which clinched the game in walk-off fashion in the twelfth, landed beyond the bullpen in left. There likely is no one happier about this apparent return to power than Upton himself, and, especially with J.D. Martinez out with an elbow injury, it couldn’t be more timely for the team. Upton’s homers last night inspired celebration, but Miguel Cabrera’s, which gave the Tigers a 2-0 lead in the first inning, inspired awe. I’ve never seen a Comerica Park home run hit where Cabrera hit his last night. No one has.